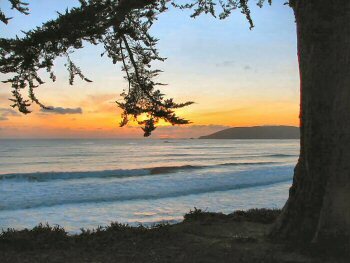 California Beach Sunset - Sunsets are a special time of day and can be beautiful most anywhere, especially during the fall and winter seasons. 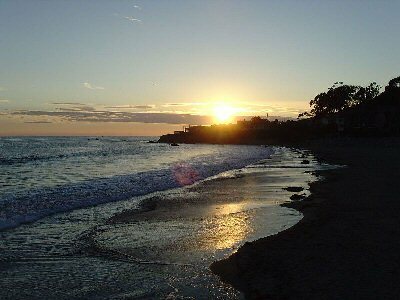 But there is something very special about a "beach sunset" that puts a wonderful cap on a great day at the beach. A previous Photo of the Week selection. I find that there is something quite special about sunsets, and particularly sunsets at the beach. I've written about this calming part of the day in several places on this site - one on the List of Beaches page and again on a page showcasing a sunset by Morro Rock. I don't think I've heard anyone ever say - "Nah - I don't need to see the sunset, I saw one yesterday". Each one is unique, each one is mesmerizing in its own way. 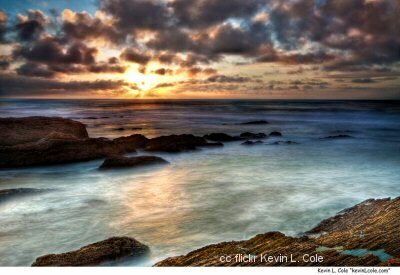 Another beautiful California beach sunset - this one at Montana de Oro State Park, just south of Morro Bay. 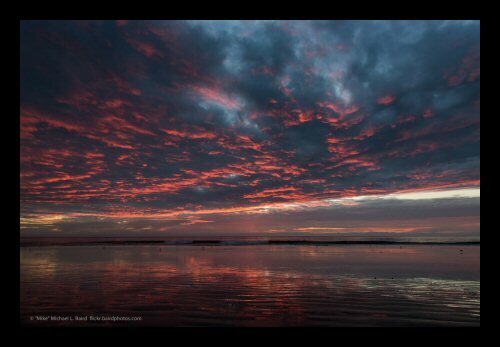 This time of year, autumn and winter, hold the prospect for some of the best sunsets of the year. The weather in Central California generally comes off the ocean and these seasons bring an abundance of clouds which makes for the best end of day light shows. 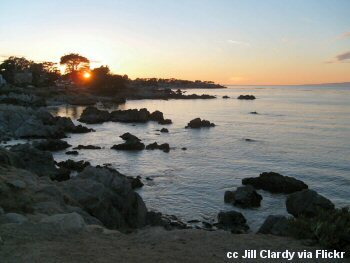 Here is a nice photo of a sunset taken in southern Monterey County. I liked how the brightness of the sunset skylined the trees along the ridgeline. And yet, as nice as it is, there isn't quite the emotional appeal for me equal to the beach sunset. I'm guessing here, and certainly invite your comments below if you have more to say about this, but it seems to me that there a draw of the far horizon at the beach that makes an ocean sunset so evocative. But maybe none of that really matters. Just enjoying the beauty for what it is and not trying to figure it out. 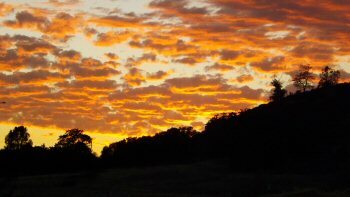 Below is a very short time-lapse of a sunset in San Luis Obispo. The last few seconds are quite pretty.